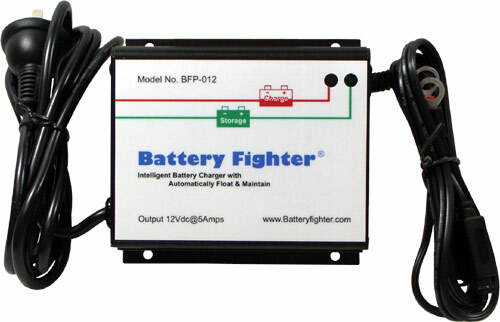 12V 5A Fully automatic 4 Stage Lead Acid battery charger. Complete 4 Step Constant Current Microprocessor Controlled Charging Program. Reverse Polarity Protection on PCB. Includes 2 output lead sets giving the user a choice of BFL2 ring terminals or interchangeable BFL1 alligator clip leads attached via constar quick disconnect connector. Perfect for a wide range of lead acid battery styles from Flooded, Sealed, Maintenance Free, VRLA, and Gel to AGM. Although they often appear to be a better economic choice for the typical consumer, trickle chargers do not have the advantage of sophisticated microprocessor electronic control. What appears to be a cost savings for the charger may actually cost several times the charger price in replacement batteries. This is the difference between the Battery Fighter and the other 2 step Lead Acid Chargers. Alternative connector types are available. Click here to see the range. More information on the range is available from the data sheet below.